Cisco’s latest Smart Wi-Fi Router, the Linksys EA6500 , features six antennas and 802.11ac wireless technology. Cisco is raising the bar on wireless networking and connectivity with its latest two offerings, the Linksys Smart Wi-Fi Router and compatible Universal Media Connector, both powered by next-generation 802.11ac wireless technology. Cisco said the 802.11ac standard allows for up to three times faster wireless speeds. The router will be available through major retail outlets in August, and the Universal Media Connector is expected to follow in September, though Cisco did not offer information on price. The Linksys EA6500 router contains six internal 3D antennas for mounting on walls or horizontal surfaces, and is backward-compatible with prior wireless networks and devices using 802.11a/b/g/n, so the new router can be linked to legacy Wi-Fi networks. Notebook, smartphone and other mobile device manufacturers are expected to start introducing 802.11ac products toward the end of this year. In addition, the EA6500 sports a new, more streamlined and stylish design inspired by the Linksys E4200 model. The EA6500 also comes packaged with Cisco Connect Cloud, the company’s cloud platform that provides anytime, anywhere access to the home network and its connected devices from a Web browser or mobile device like a tablet. A range of applications from Cisco and third-party developers are available for devices running Apple’s iOS or Google Android operating systems. There are six new developer apps, including HipPlay, an app that lets users’ search and “beam” online videos to a Smart TV or AirPlay compatible device, and Twonky Video, a mobile browser for smartphones and tablets to browse online video services. Cisco also introduced SimpleTap, which lets users connect devices to the router with the touch of a button or with a swipe or scan of a device or tag. The company also announced the opening of its Linksys Developer Community to assist app developers interested in working with Cisco to expand the Cisco Connect Cloud home network platform for Linksys routers. 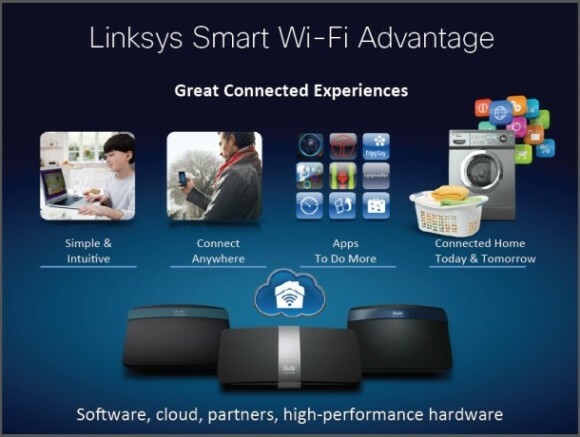 The Linksys Universal Media Connector, which is optimized to work with the EA6500 router, lets users connect wired devices such as smart TVs and game consoles to their Wi-Fi network and stream high-definition or 3D HD video content wirelessly. The connector, which operates in the 5GHz band—Cisco said this spectrum band provides a cleaner signal—offers four gigabit ports for multiple device connections.